One or more photo(s) has been virtually staged. Incredible views, incredible features, incredible location. This 4 bedroom 3 bath home was built in 2015 to take full advantage of the best that Florida offers. 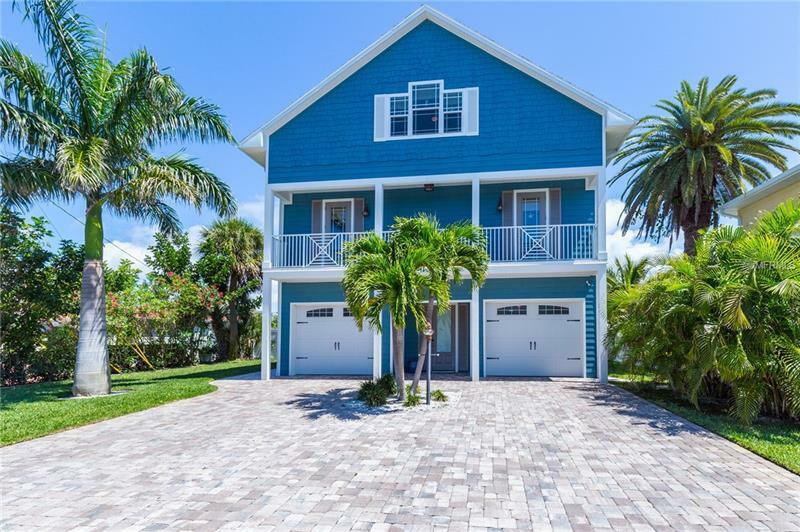 Located on the intracoastal waterway of Boca Ciega Bay, this home has something for everyone from the top down. The third floor has 2 bedrooms and a bathroom with a walk in shower. Off of the east bedroom is a deck overlooking the bay where you can enjoy your morning coffee while taking in the sunrise and watching for dolphin. The second, and main floor, has 2 more bedrooms. One is an owner's en suite with dual sinks, plenty of drawer space and a marble counter top. Enjoy the open concept of living room/dinning space and kitchen, all with views to the bay as well. Open the sliders and let the breeze flow through. Step out onto the deck for panoramic water views. The garage on the first floor has enough space for at least 4 cars and much more. An elevator connects it all. Outside you can enjoy the salt system pool or take a walk down your own dock. Get on your boat for a cruise around the bay or just hang out enjoying the scene. All this and yet there's more - you are only 2 blocks from the white sand beaches of the Gulf of Mexico. From morning coffee on the deck to sunset on the beach. You have it all. This home was built with 24 solar panels to harness the sun as much as possible lowering the cost of running it. Photos of 3rd floor rooms are virtually staged.